Self-Defense. In case this is the first article you are reading from ConcealedCarry.com, we take it pretty seriously. You likely hear stories very often of citizens, under life-threatening circumstances, putting their lives on the line to defend themselves or others from criminals who mean them harm. But are there times when defending yourself may cause more harm than good? Let's take a look at an example of defending yourself that sees a lot of people give a lot of different answers regarding the best way to handle it. Carjacking. Now there are two very different legal definitions that we should talk about before going more in-depth. Carjacking vs. Car Theft. 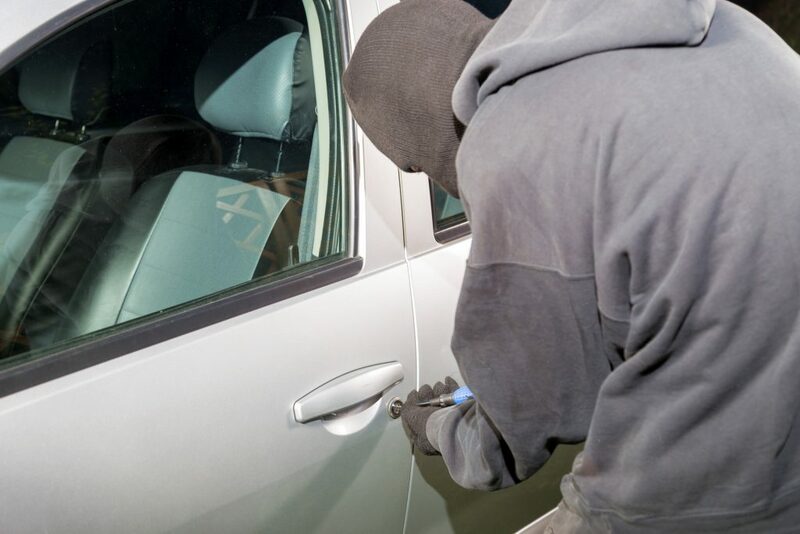 Car Theft is an incredibly prevalent crime in our country with the FBI's 2016 crime report stating that over 760,000 took place across the nation during the calendar year, losing U.S. citizens $5.9 billion in property during that time. Carjacking, on the other hand, is much different. Massachusetts actually refers to it by what should be its dictionary definition, “assault with the intent to steal a vehicle”. So going forward, know that there is a difference between the two and that there are different legal barriers for both, with regards to your ability to legally use your firearm. As many of you know, gun law between states in the U.S. can be quite confusing. Even in reading this article you may see some information that does not pertain to you simply because of your state's stance regarding “Stand Your Ground” laws vs. “Duty to Retreat” laws. Make sure that you check and see which side of this your state's stance lies before jumping to any conclusions that you may come to from reading this piece. All that being said, let's look at something that may be considered the most universally correct, no matter where you live and that is shooting at a person that you find stealing your car. Meaning that you see someone in a parking lot, side street, or your driveway simply breaking into your car. While it is well within your rights to attempt to deter the criminal from doing what they're doing (turning on Flood Lights, making loud and sudden noises, calling the police and hoping they show up quickly) it is generally considered a terrible idea to go into this situation guns metaphorically and literally blazing. We have seen many stories over the years of individuals catching criminals attempting to take their car and getting into legal trouble for doing so. Even in Stand Your Ground friendly Georgia, attacking someone who is attempting to steal your vehicle while posing no threat to your or anyone's safety could land you in legal trouble. Simply put, if you are not being threatened with violence and you go on to commit violence, you're the aggressor and a pretty easy case can be made against you in front of a jury no matter how in the right you are, common sense wise. But what about if someone is threatening you for your vehicle? What if someone had a gun on you and was demanding your car or they were going to kill you? Surely that must be grounds to defend yourself, right? Unfortunately, not everywhere. As we have mentioned in a previous article, despite popular belief, in most states a car is not an extension of your home. So the same rights that you have to defend yourself within your home do not necessarily apply to your car. So the question rises. Can I or Should I shoot at a Carjacker? Well, in order to legally justify an act of self-defense you need to show your action was reasonable, proportionate, and in response to an immediate threat. Depending on the state you live in, you may also have to show you didn't have a safe course of retreat. You should still check the laws in your local area for more personalized information to you. On the whole, though, the same laws that apply to other public threats to your safety will apply to you in your car. 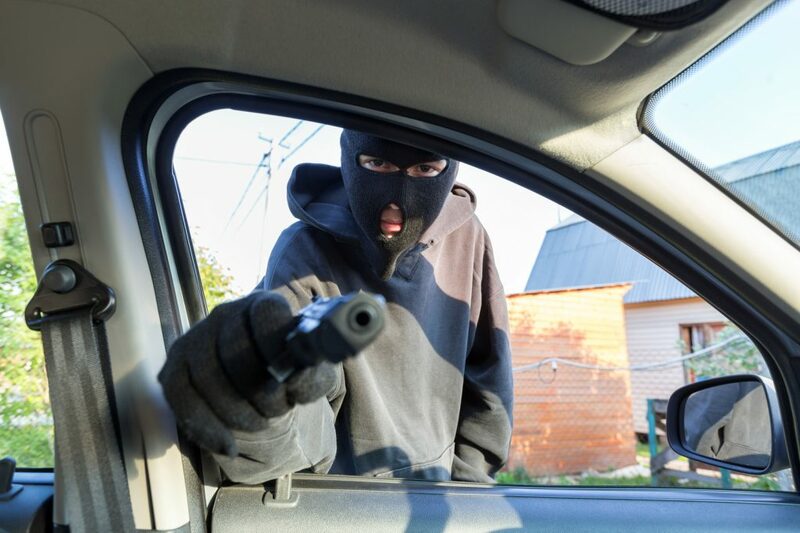 If you are threatened and feel your life is in danger, you may defend yourself from carjackings. 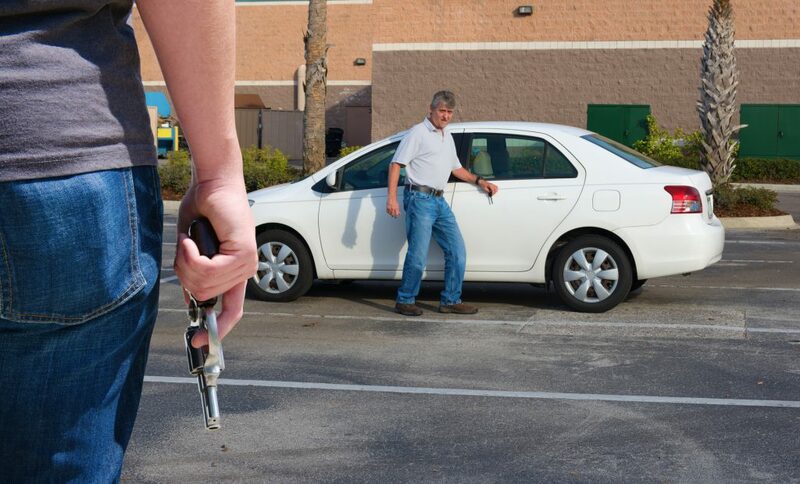 If you are not being threatened and see a car theft taking place, using a firearm to stop the crime could see yourself committing a more serious one. Cars are property after all and almost without exception you don't have the right to use deadly force to protect any form of property. So what do you think of this article? Did it provide you with any helpful information? Did it raise more questions for you? Let us know in the comments below so we can start a conversation. 17 Responses to Can You Shoot a Carjacker? The article never addressed the scenario posed in the leading photo: an armed carjacker in the driver’s face. I certainly would defend myself, and fortunately I live in a Stand Your Ground State. The writer addressed that scenario in the first paragraph about carjacking….”someonehad a gun on you and was demanding your car or they were going to kill you”. Some years back, a man named Alva Campbell was being transported in a wheel chair from the Franklin Country Jail to the County Court in Columbus, Ohio. He overpowered the guard, took her weapon, carjacked and killed an unarmed young man as he sat at a traffic light to make his escape. He was caught a short time later by Columbus Police. I think if I was carjacked by a perpetrator with a weapon, it would be better to be judged by 12 than carried by 6. If the vehicle was being broken into or someone attempting to steal it I’d simply call 911 and give the best description possible, then call my insurance agent. If someone has a firearm drawn in order to threaten me to the point of relinquishing my car, I will clearly shoot him if I have the opportunity. Today, with the value of life diminishing and lunatics increasing,a brandished firearm during the commission of a crime means that the criminal is going to take my life. I don’t believe any clear-thinking jury member (in today’s society) would disagree with that action. I would appreciate any and all comments on my thought process. Hey Doc, the standard is always the same, it is the reasonableness standard. But, what people determine to be reasonable varies, so this is where the uncertainty in outcome lies. With the basic facts you presented, I agree that anyone would find it reasonable to assume that you feared that the person demanding your vehicle while pointing a firearm at you was likely to cause death or serious bodily injury. The other part of the equation is that in some states there is a duty to retreat. This raises another ‘reasonableness’ standard where the question is: did the person defending themselves and claiming they used deadly force in self-defense, have the ability to do something else before resorting to deadly force? Again, in the scenario you mentioned, I believe most anyone would agree that there was not another reasonable course of action. And finally, with the exception of my great state of Ohio, the prosecution must prove beyond a reasonable doubt that your actions were NOT reasonable. This means everyone on the jury must agree that your actions were not reasonable, which is a high standard. In Ohio, the defendant must show that he/she met the standards and prove that they did not create the situation, were unable to retreat and that it was reasonable. A completely backward way of looking at the idea of innocent until proven guilty. So yes, you were right on, at least in my estimation of what is reasonable 🙂 Thanks for the message! Rember people in Communist California read this too. And the jury there would probably hang the car owner. Gee, kind of sounds like the Laws are written to protect the bad guys , huh? Back in the fall of 2008, while on my way to work at 5am, i had a guy step out in front of my car at intersection trying to flag me down. Living in a very small town, i assumed he needed help ( car broke down, medical issue, fire somewhere or ???? ) Next thing i know, I’ve got a 45 1911 pointed at me and him screaming…Get the “F” out of the car. When he screamed the same command the 2nd time, i still had the car in gear and had the mindset to just smash the gas and drive away…i called 911, told them i had someone try to Carjack me and where it happened… about 1/4 mile away, i came across 2 police cars with one of the officers leading away a guy in handcuffs. I got out of my car, told them what had happened, they were in their radios and police cars were flying to where the guy was immediately. And he was still there waiting on another car to show up i assume. He got down on his knees, put the gun to his own head and threatened to kill himself. He finally put the gun down and was arrested. What i didn’t know was that the police had pulled him over earlier with the guy i seen in handcuffs. The guy that had flagged me down had got out of the truck the police had pulled over. ( they had received a 911 call from another person saying they had pointed a gun at them while they were driving) he then turned and fired that same 45 at one of the deputies missing him, ran… crossed a creek, came out from between some buildings and tried to carjack me, so yes.. he was desperate to get out of there.The police also found a bag he had thrown away with almost 50 small bags of Meth…he as later sentenced to 30 years for the attempted carjacking and shooting at the officer on a plea agreement. So… in this situation, i did NOT have a handgun with me for self defense. ( I live in Indiana)..i often wonder.. what would i have done if I were carrying myself that morning… would i have pulled it and shot him with the possibility of him shooting me back, if i had shot him,escaped and he died, would i have been arrested for murder when i had a chance to drive away like i did? All questions with answers I’ll never know. What i can say is… everything happened so fast, there wasn’t time to think, do this or maybe this or what about that. The police told me i did the best thing i could have… had i got our of the car, he could have shot me, and drove away… yes, they would have found my body, but they would have not had any idea what i was even driving for awhile, giving him the chance to be long gone. I was awarded a civilian service metal for having had the mindset to call 911 immediately after i drove off and finding the police, and giving his location before he ran off. So, again… not sure in this State how it would have all played out in a different scenario. I do carry a 9mm handgun with me now everywhere i go. Lesson learned as they say… things can happen even in a small town. Are there actually some states that don’t see armed robbery as a lethal threat? You’ve just been threatened with deadly force. If you can’t defend yourself against that, why carry a weapon at all? Regarding retreat, if he’s within speaking distance, you can’t retreat from a bullet. Even in a car, a 9mm can pass through both doors or pass through the trunk and hit the dashboard. You may not have an opportunity to defend yourself and may be forced to comply. But compliance is risky. I’m not saying I know what I’d do, but I’d sure like knowing I could legally defend myself (and those with me) if I felt it was necessary. D Bell, I think the laws of any state would consider a verbal threat from an armed attacker that they were going to kill you as a viable and imminent threat of deadly force and so you would be justified in using deadly force against that threat. The picture of the gunman with his arm inside the car and the gun so close to my head (putting myself in that situation) gave me a couple of thoughts. 1) There is no way I have the ability to grab my gun without his going off first; 2) a quick left hand on his wrist, my right hand on the shift to drive or reverse (whichever is most feasible), and my foot stomping the gas. This action may get me shot, but it may not. And it may throw him off enough that I can a) grab my gun and end the struggle successfully to my satisfaction and safety if he is still intent on harming me or someone else now that I’ve made him angry and embarrassed; b) cause him to flee for safety. I have to tell you, this picture is my worst nightmare. He’s too close, and that means I’m not paying attention. Situational awareness is the key to survival. Thanks for the article, and the reminder to always be aware of my surroundings, and the local gun laws surrounding Stand Your Ground vs be a victim. Not A Victim! I feel that pointing a gun at someone is a lethal threat regardless of the motive. If I have a gun pointed at me, I’ll do whatever is necessary to mitigate that threat and then call the cops.